Sales are falling as investors fear that U.S. incentives might not be renewed. The Solar Energy Industries Association president lays out his plan of attack and says he's confident an extension will come through. After two failed attempts to extend the renewable-energy tax credits set to expire at the end of this year, the solar industry is feeling the conflict of uncertainty. And at Piper Jaffray's Clean Technology and Renewables Conference in New York on Wednesday, the president of the Solar Energy Industries Association laid out his latest battle plan. 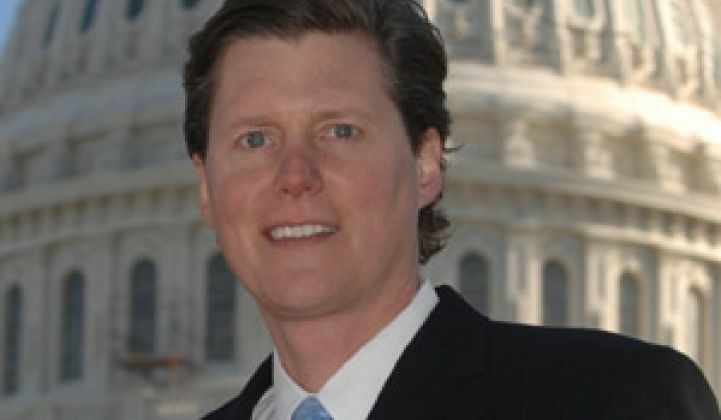 Armed with an arsenal that includes a political action committee and the introduction of another bill attempting to extend the credits, Rhone Resch said the SEIA is pressuring politicos on both sides of the aisle to extend the renewable-energy tax credits. "It's not a revolution until some blood gets spilled," he said. But those weapons of political warfare might not be enough. The bill, which according to Forbes would extend the current 30-percent commercial investment tax credit for eight years, extend the residential tax incentives for six years and raise the cap on those residential credits from $2,000 to $4,000, calls for a rollback of oil incentives to pay for the wind and solar credits. The same idea passed the House only to fail in the Senate last year (see Senate Rejects Incentives to Pass Energy Bill). And that means the association might end up scrambling to find alternatives. If the current bill fails, along with three other possible bills aimed at extending commercial credits for eight years and residential credits for six years, the association plans to pursue a one- to two-year extension to hold the industry over -- as it did last year. All the uncertainty is taking its toll on the solar industry, which already is seeing sales drop off, Resch said. While he wouldn't name the companies that are being affected, he said that three large-scale solar projects, each valued at $25 million, were killed this week. The financial backers didn't think the projects could get online before the credits expire at the end of December, he said. Earlier this week, the American Council on Renewable Energy said the industry faces the cancellation of up to 42 gigawatts of projects in 45 states if the incentives aren't renewed. But Resch also said he is confident the credits will be renewed in some capacity. And Jesse Pichel, a senior research analyst at Piper Jaffray, isn't worried, either. After all, the United States only makes up about 5 percent of the global market, so even if the incentive isn't extended, the bulk of the market would be left intact. "Wall Street is more nervous about the lack of clarity for subsidies and policies in Europe," which is the largest solar market, Pichel said.